U.S. stocks pushed higher during the shortened Thanksgiving Day holiday week as investors embraced generally positive economic data and expressed optimism for stronger-than-expected holiday retail sales. Including Friday’s abbreviated session, the S&P 500 has closed at an all-time high for 54 out of 225 trading sessions this year. On average, this represents a new record every four days, the third–most since 1928. Among key economic data last week, the Conference Board’s Leading Economic Indicators Index rose 1.2% last month, topping forecasts. This follows a revised 0.1% September increase that was originally reported as a 0.2% decline. Also favorable, Treasury Secretary Mnuchin said he expects the Senate will approve a Republican tax reform bill and send it to President Trump for approval by Christmas. On Friday, the S&P 500 finished above the 2,600 level for the first time, ending at 2,602.42. For the week, the S&P 500 gained +0.93%, the Dow Industrials rose +0.86% and the MSCI EAFE (developed international) advanced +1.88%. 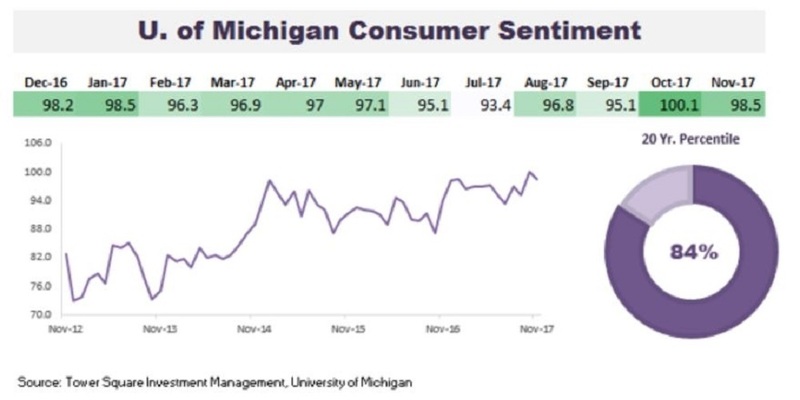 The University of Michigan Consumer Sentiment Index is a survey of consumer confidence conducted via telephone to gather information on consumer expectations regarding the economy. As Chart 1 illustrates, November’s consumer sentiment reading was slightly lower than October, but still registered its second highest reading since 2004. Moreover, November’s consumer sentiment reading of 98.5 is stronger than 84% of all readings in the last 20 years. Consumer confidence at this level is a positive sign for continued strength in consumer spending and great news for retailers ahead of the holiday shopping season. It is not a surprise that consumer confidence is elevated with the unemployment rate at its lowest level since 2001 and the stock market in its ninth year of the bull market.